Sankranti also known as Pongal is a major Indian Festival and one of the few Hindu festivals based on the solar calendar. 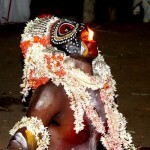 Essentially a harvest festival it is celebrated with great fervor in agrarian communities. 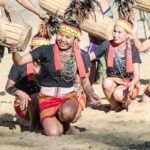 In Punjab, it is celebrated a day before Sankranti or Sankranthi in form or Lohri and in south India it is called Sankranti or Pongal depending on the region. 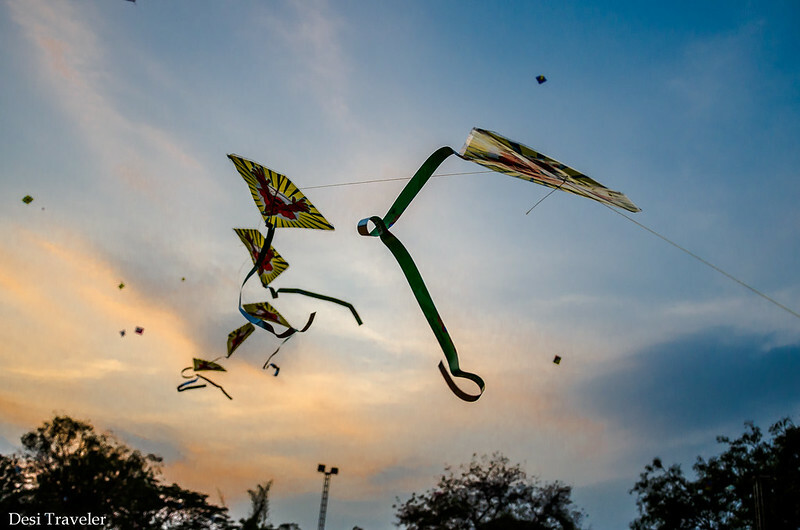 Kite flying is a major tradition in India on Sankranti, though in parts of India kites are also flown on 15th of August, to celebrate Indian Independence Day. If you have watched some of the ads on TV recently even Google is using a kite flying scene in one of its ads. In another TV commercial, Big B is flying kites and thoroughly enjoying the same with kids. 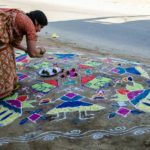 Another major tradition on Sankranti is to decorate houses with colorful rangolis. 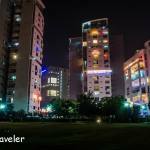 In evening light is not good to click good pictures. But all these excuses could not stop me from visiting Hyderabad Polo & Riding Club or HPRC near Mrugavani National Park to click pictures of Kite Festivals. 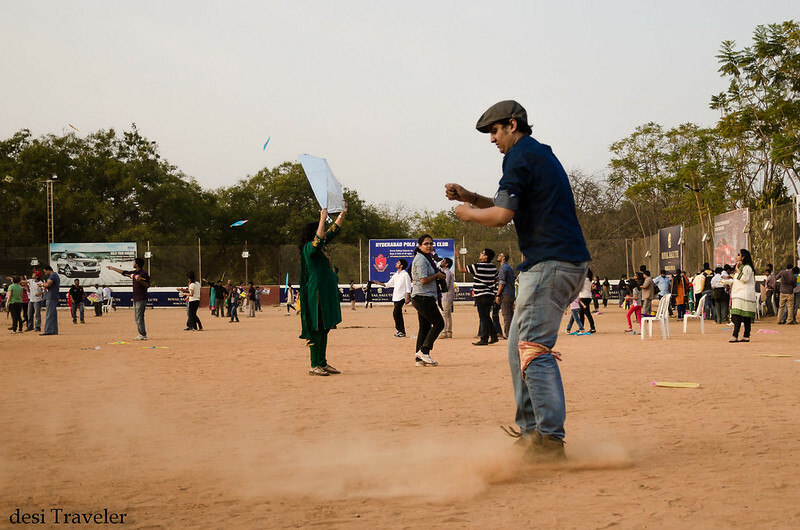 Nowadays due to lack of open spaces in the city and no concept of open terraces in most buildings kite flying is tough so I was happy to visit HPRC and see hundreds of people flying kites in the open space where normally horses gallop. 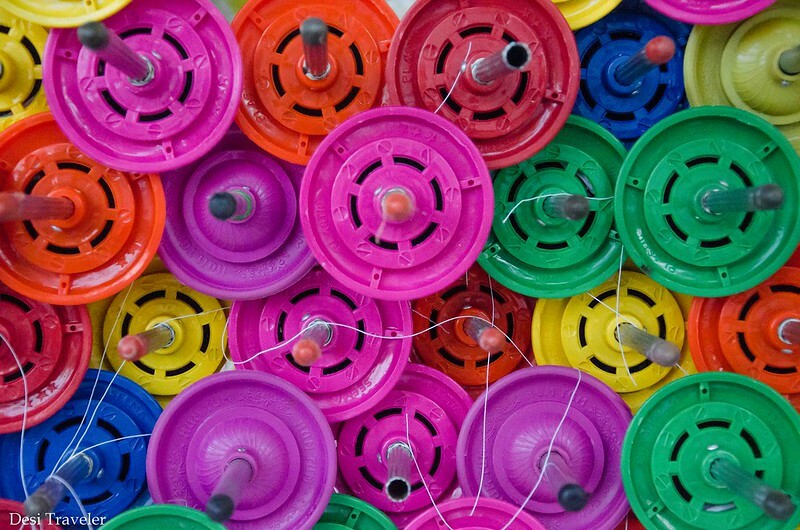 So without taking much of your time let me just take you on a kite flying day and evening. 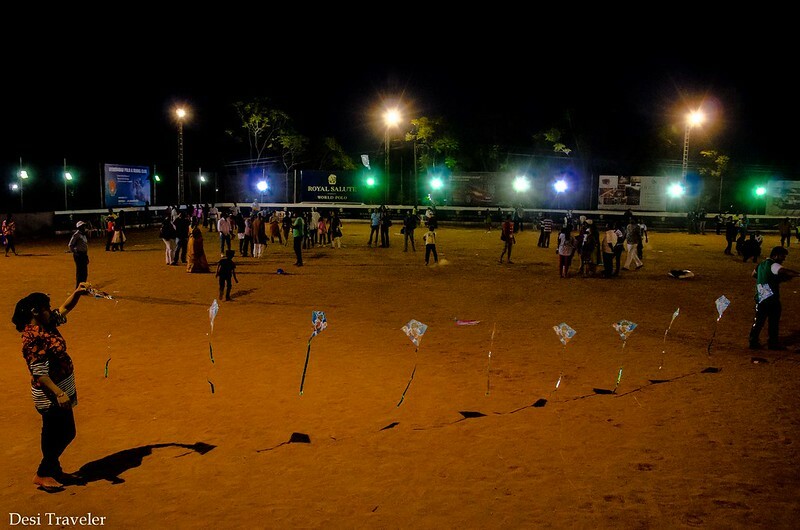 I say evening also because even sunset did not dampen the spirit of kite flyers and they continued in flood lights. Soon it was time to fly sky lanterns and we had blue, orange, yellow and white sky lanterns competing with kites to control Hyderabad Skies. When I was a kid only normal rhombus shaped kites were in vogue, but today you get kites of all shapes and size. 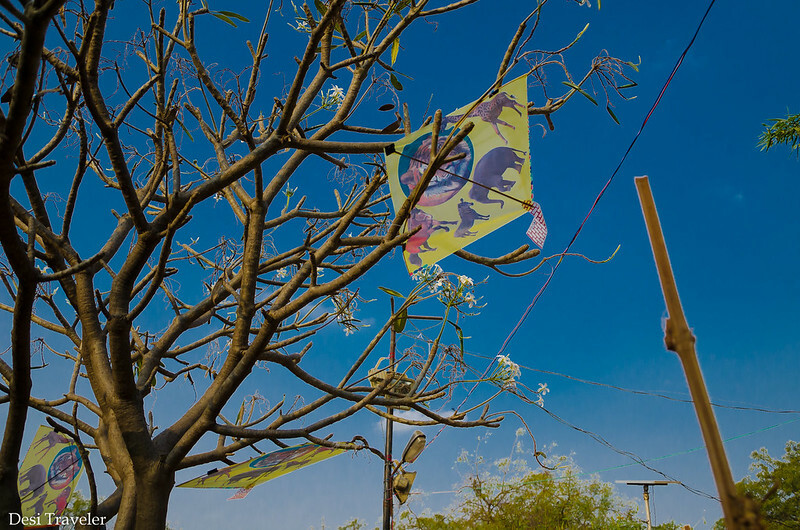 I saw kites in shape of a Bat, dragon, multiple kites and even paper lanterns to fly with kites. But you can not fly a kite without a Charkhee, on which the manjha is rolled. 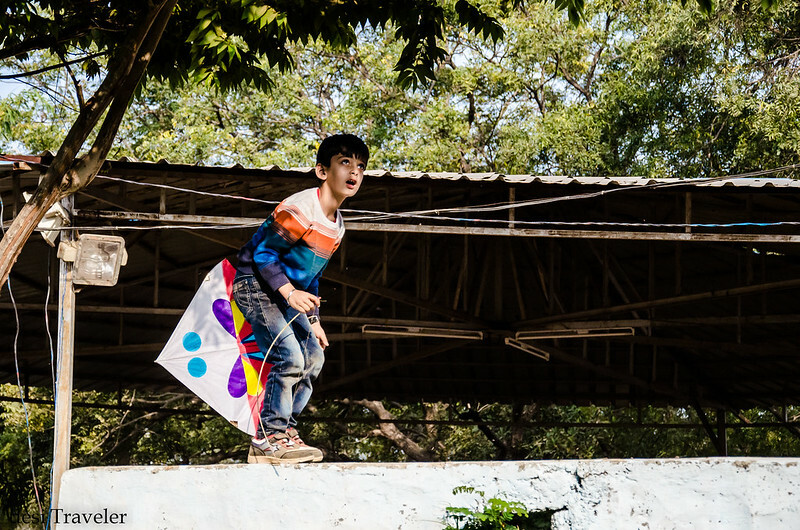 Each kite flyer has a team and one of them is responsible for making sure that manjha rolls and releases smoothly when you are in a kite fight. But no matter how many kites you have, there is no better fun than getting one that has been cut by somebody else. I still remember risking my life and limb as a kid to get hold of a kite stuck in a tree. dialogue from famous actor Rajkumar” It is not a plaything for kids, if you will bleed if it cuts your hand” of-course he said it in reference of a Rampuri Chaku. But kite manjha can cut your hands and bleed you. Remember I don’t fly kites because the string can harm birds. But I am no body to preach you. 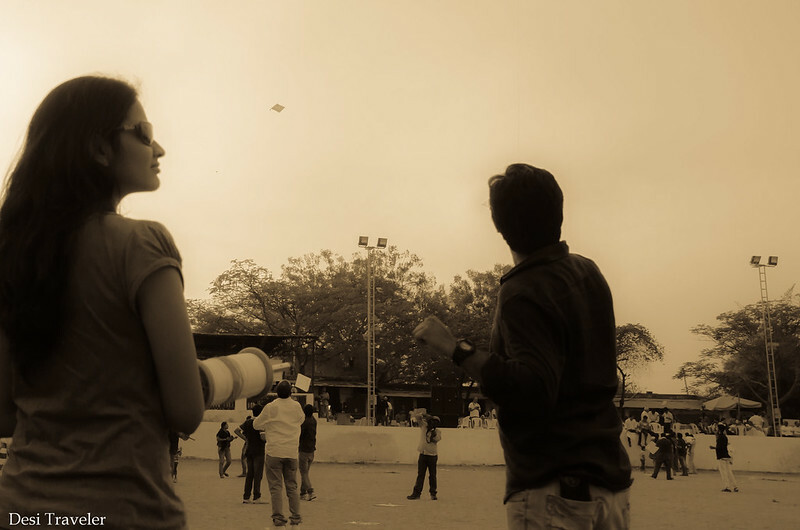 Anyways if you thought kite flying is only for kids look at the picture below. 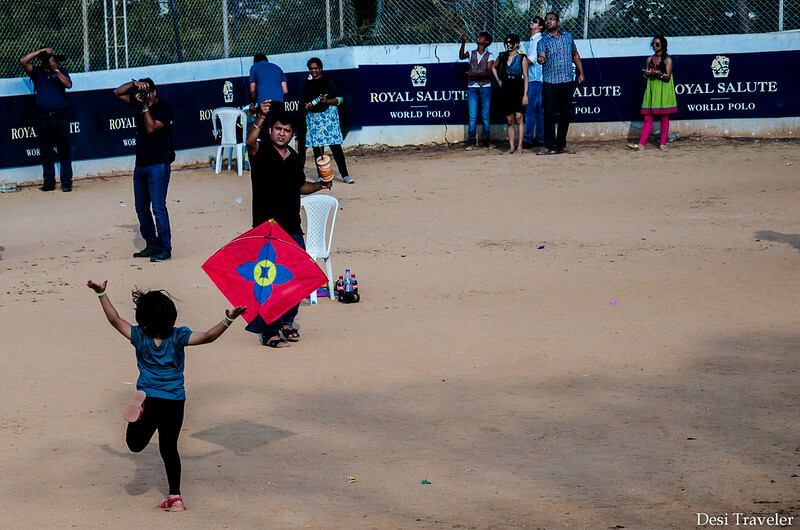 So you thought kite flying is for kids? 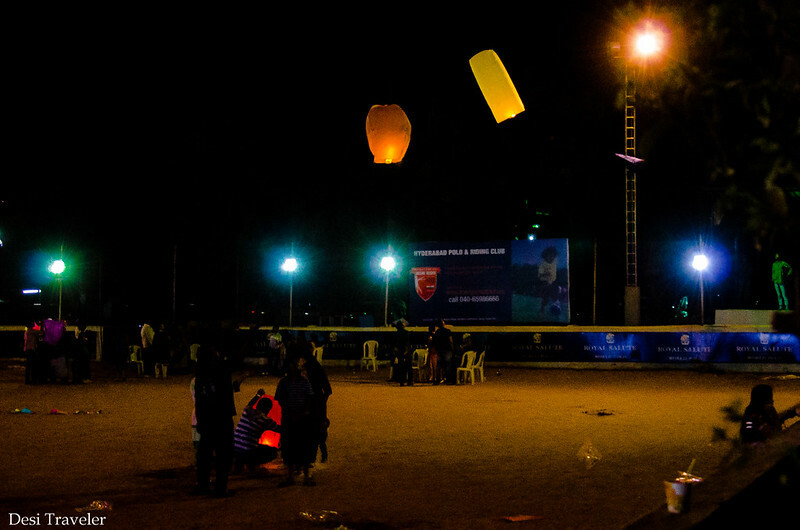 Soon it was time for Sky Lanterns or Fanush as they are called locally. Now making and flying a Fanush or Sky Lantern which is an art in itself. Release a sky lantern too soon and it will fall on the ground, hold it too long and you will burn your hand and the lantern. 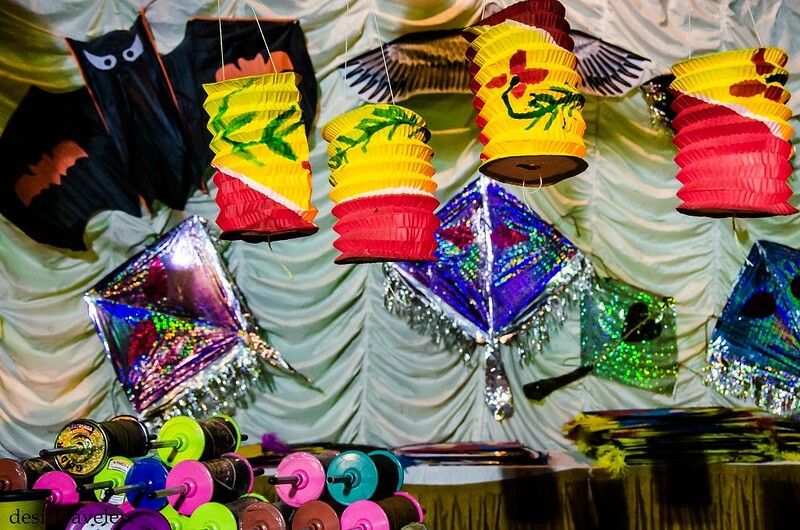 The Fanush or Sky Lanterns are mostly associated with Chinese and Buddhist festivals in South East Asia like the Sky Lantern Festival in Chiang Mai and Loi Krathong festival in other parts of Thailand. Based on some Google Gyan, the one of the first organized Fanush making and flying in India started in Kolkata by a certain Mr. Dey Darjipara of North Kolkata in 1912. 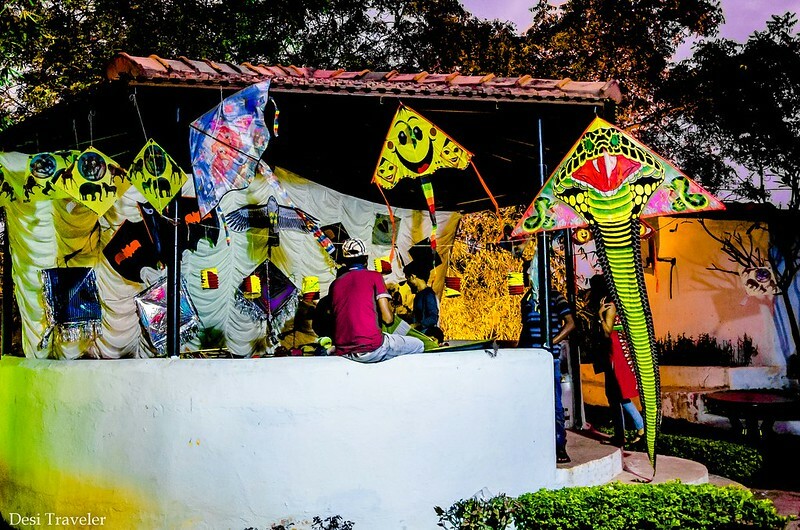 Slowly the Fanush flying became integral with Kali Puja ( Diwali is celebrated in Bengal more as Kali Puja but on the same day as Laxmi Puja better known as Festival of Lights Diwali ). 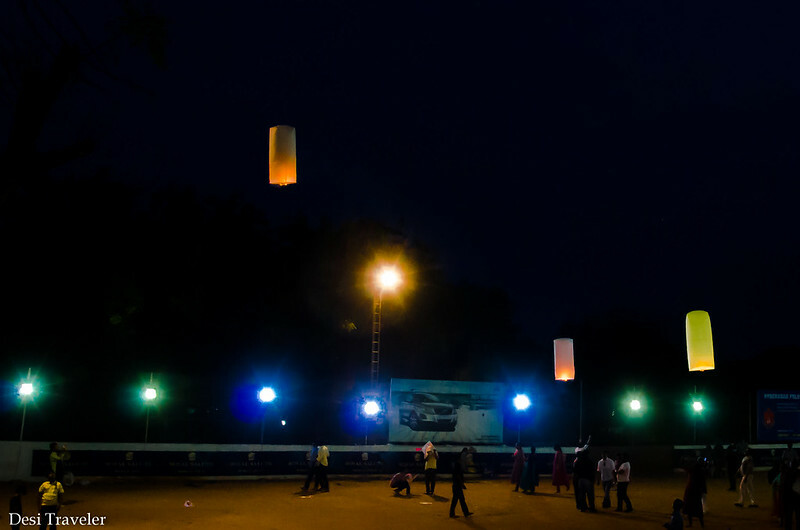 Today many Sky Lantern festivals or Fanush flying festivals are organized all over India and we were attending one such in Hyderabad. You need to know just when to release it. Hint: It will start putting a bit of upward pressure when ready to launch. 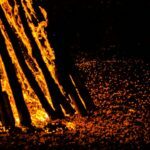 Kids should be kept at a distance and not allowed to play with fire. Make sure your Fanush or Sky Lantern is held perfectly vertical so that it goes straight up and not sideways. Make sure you are not wearing loose free flowing clothes as they can easily catch fire. If it is too windy avoid flying Fanush as the Fanush may not go higher up and move sideways to buildings close by. So what do you say? 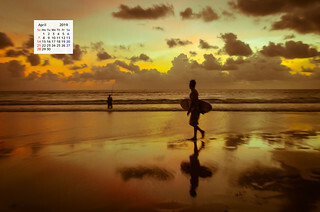 Are you a kite flyer of just an observer like me? Feel free to leave your view in comments, whether you fly kites or just watch them flying both are OK with me. Only one request try not to harm any birds when you are flying kites. 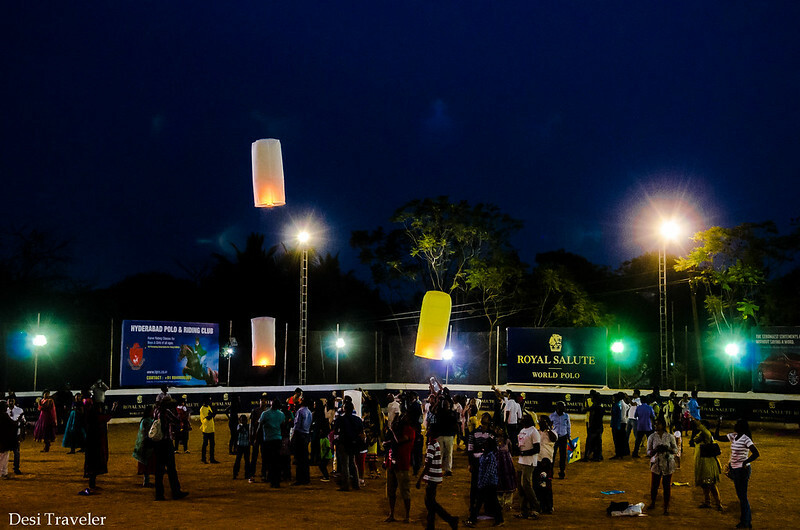 Brilliant… The flying lanterns were practiced in Thialand too. Your skywatch photo fascinated me so I was delighted to find all the images and the detailed description of kite flying on your blog – lovely! Definitely will try sometime. 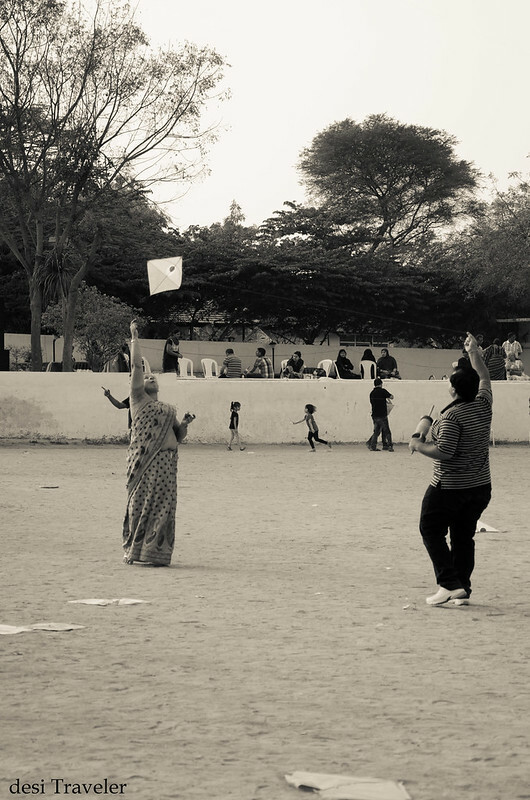 Will share my post on Kite flying. What amazing shots – so magical!